For Less Than 4 US Dollars! 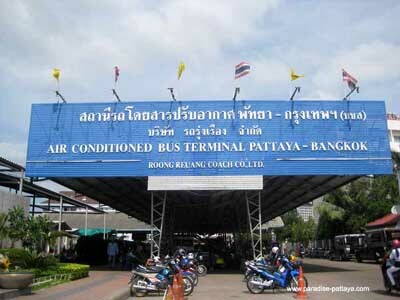 The best way to get from Pattaya to Bangkok by bus is to catch a bus at the bus station in Pattaya Nua. The station is an easy landmark for any taxi you ask to take you there. The buses are modern and have air conditioning. They leave regularly and on time. You also can get food and drinks before you at fair prices for Thailand. Note: That's also where the Bell Travel Bus Service in Pattaya leaves from for the Bangkok Airport is leaving from. "Where Is The 'Pattaya Nua' Bus Station?" The bus station in Pattaya is on North Pattaya Road (Pattaya Nua). It's at the Air Conditioned Bus Terminal Pattaya-Bangkok. If you come from Naklua Dolphin Roundabout it will be on your left hand side, past 3rd Road and maybe 1/2 mile before Sukhumvit Road. Motorbike taxi drivers and taxi drivers in Pattaya will know where the bus station is. "How Long Is The Ride and Where Will It Take Me in Bangkok?" The bus ride is a non stop 1 1/2 - 2 hours ride. The air conditioned bus will take you to the eastern bus terminal in Ekkamai. I find the Ekkamai bus station very convenient since it is right by the Sky Train (BTS), Ekkamai station. You can take the sky train from there on and stay out of the crazy traffic in Bangkok. Grab a Bangkok Map when you pay for your sky train ticket. Most expensive trips are 40 Baht (around USD 1) on the sky train or you can buy a day ticket for 120 Baht (USD 4). Get your camera ready too - you can take lovely pictures of the city from the sky. As a former resident of that city I know you'll enjoy it. You'll also enjoy the ride to the city. It will be fast and convenient...not to mention cheap!